Sure to please any designer with an eye for purism, the nesta series is defined by square bowls with sharp zero radius corners. The luxurious satin finish and heavy duty sound guard undercoating makes nesta a perfect choice for your modern kitchen. Rear drain placement and elegant drain grooves add to the functionality of the sink. 16 gauge premium grade t-304 Stainless Steel (18/10 chromium/nickel). dualmount installation: rim is brushed and finished to match the inside of the sink allowing the sink to be installed undermount or flush mount (top mount). luxurious satin finish - easy to clean and long-lasting. Heavy duty sound guard padding and undercoating. Zero radius - sharp inside corners accentuate the modern look. Exterior dimensions: 14" x 18". interior dimensions: 12" x 16". bowl depth: 8". 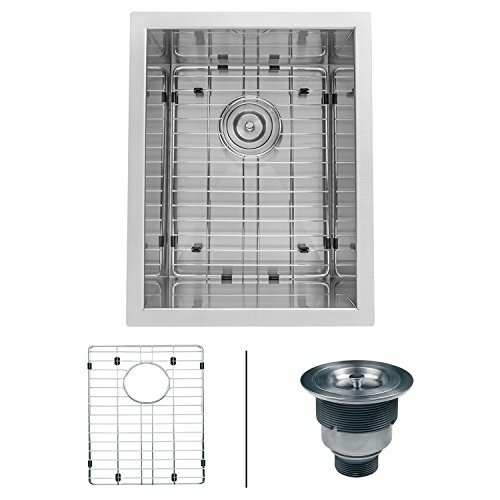 standard 3.5" drain opening will fit any garbage disposal unit.. included in box: sink, cut-out template, mounting brackets, rinse grid, basket strainer. Ruvati limited lifetime warranty.